Let Us Take You to Crab Island! Cruise into the sunset and enjoy up-close encounters with Dolphins on our daily cruises. sun set and cruise into the night with fireworks. Perfect for Family Reunions, Bachelor/Bachelorette Parties and More. Let us take you – you bring the fun and drinks, we’ll do the driving! SunVenture Cruises is the easiest and most affordable way to experience Destin Florida on the water. Our Coast-guard licensed captains are taking daily cruises on sporty catamarans from two convenient locations – the Destin Harbor and Okaloosa Island. SunVenture Cruises offers a variety of boat tours including Crab Island, an unforgettable underwater playground experience. Other daily cruises include Sunset Dolphin Cruises, Sunset / Fireworks Cruises, and Private Cruises. while you navigate the busy waters? 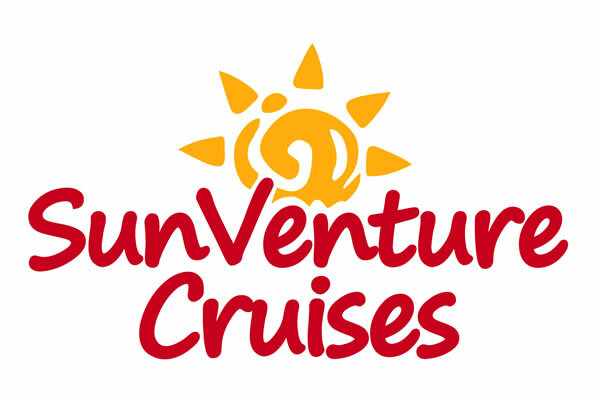 Book a SunVenture Cruise for a fraction of the price and let our experienced captains take you. Reserve online today or call us at one of our two locations! Experience the difference with SunVenture Cruises. Stress-free boating: Our Coast-Guard Licensed Captains navigate the busy waters while you relax and have fun at Crab Island or on Dolphin and Sunset cruises. Restroom on-board: Our boat and captain stays with you the entire time of your cruise, giving you full-access to a bathroom and shade. Let us take you to one of the top things to do in Destin – Crab Island, an underwater sandbar only accessible by boat. Enjoy a short boat ride from either of our Okaloosa Island or Destin locations. Our captains will navigate the busy waters and drop anchor at the epicenter of all the fun. Our boat and captains stay with you the entire time at Crab Island so you can enjoy the convenience of shade, BYOB and a restroom on board. Relax in pristine, waist-deep emerald green waters at Crab Island. This floating playground destination that has something for everyone – live music, inflatables, kayaking and relaxing fun in the sun. You can ‘venture’ aboard for other unforgettable cruises like our up-close and personal Sunset Dolphin Cruises. Experience a majestic scene as the sun sets over the iconic Destin bridge while dolphins frolic in the pristine emerald green waters. Our boats give you the closest views on our Destin Sunset Dolphin cruises. Enjoy the best of both worlds on our Destin Sunset Fireworks Cruises. Cruise near the beautiful Destin Harbor at sunset, perhaps see a dolphin and end your night with a memorable bang as the sky illuminates with fireworks. We can also accommodate up to 98 guests for a private cruise of your choice – perfect for family reunions, bachelor / bachelorette parties and more. Daily cruises from two convenient locations, just 5 miles apart. Don’t see your desired cruise or time? Check the cruise schedule at both locations for availability.